Each of these explanations, I think, is a little bit off. The first and the third theory make predictions about what a student “thinks is right.” What could this mean, if not that the student, when asked, would say what they did was correct? But I think that students, when prompted to reflect on this work, would quickly identify the mistake. The second theory predicts that the student, when prompted, couldn’t explain how to properly subtract any double-digit numbers with understanding. I’m be willing to put down money that this kid, when presented with 54 – 32, could explain how to do this with as much understanding as your average kid. We need some language and distinctions to properly describe what’s going on here. The kid wasn’t thinking slowly, deliberately, explicitly. He wasn’t under the sway of a procedure or a concept. He was just doing math, not thinking about the math he was doing. He was going with the flow, doing what seemed like it should be done. The kid didn’t have an explicit algorithm that he was trying to follow. He wasn’t under its sway. The student wasn’t just operating blindly and randomly on the numbers. He wasn’t guessing. He was doing the math without thinking about doing the math, though. The kid didn’t have a mistaken concept of subtraction. He wasn’t under the sway of any particular concept. He was just doing what needed to be done. There was a mistake here? Or a misconception? Or a false belief in a bad procedure? How exactly should we describe this? Objectively speaking, it is a mistake. The word “mistake” doesn’t refer to a person’s thinking, but rather refers fairly objectively to the result of their thinking. Objectively speaking, this was a mistake. The kid said something that wasn’t true. But there’s no evidence here of a misconception. A misconception has to do with concepts, and this kid wasn’t under the direction of any mistaken concepts. He understands what subtraction is. He understands what place value is. He could tell you about them. It’s not a false belief, because there’s no evidence here that this kid believes that what he did is correct. It’s not a dumb mistake, something that happens randomly and without thought. Instead, maybe we should call this a mental bias, or a tendency towards this sort of mistake. 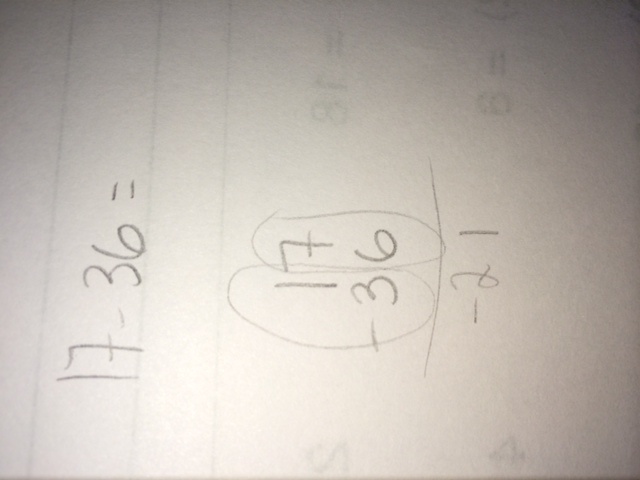 This problem has revealed an underlying bias in this kid’s tendency to subtract a smaller number from the larger number. What’s revealed is a sort of magnetic urge to take away a smaller number from a larger one, rather than a larger one from a smaller one. What do we do about those sorts of tendencies? I think that a certain kind of practice is called for, but I’m not sure. Thoughts on that? On any of this?